MusicFirst has announced a new partnership with PledgeCents a crowdfunding platform specifically for PreK-12 that enables teachers to fundraise for needs such as music services for their schools. PledgeCents allows teachers to quickly and easily create personalized campaign pages to reach their fundraising goals. 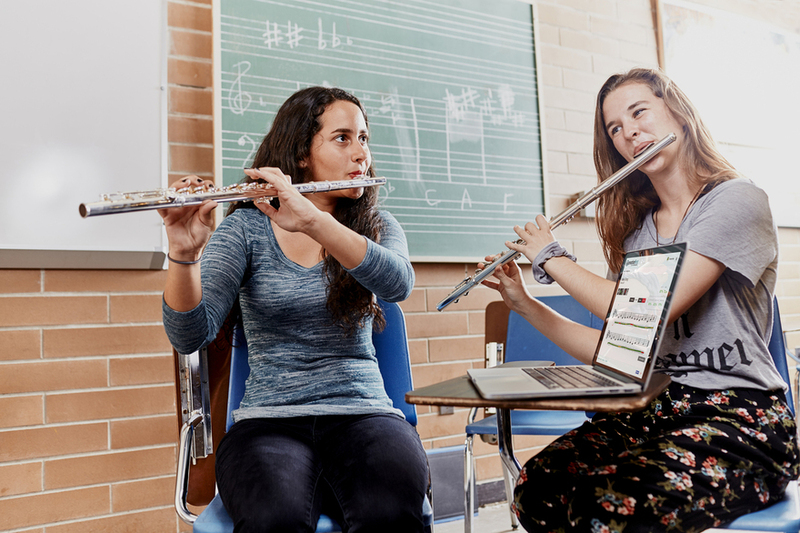 Using PledgeCents, teachers will be able to apply all funds raised to purchase and renew MusicFirst and its array of music learning and creation tools for their students. “Our partnership with PledgeCents will allow music teachers and parents to fundraise for the MusicFirst Online Classroom and share engaging, cloud-based music education resources with students regardless of budget limitations,” shares Director of MusicFirst, Dr. James Frankel. Andyshea Saberioon, CEO and Co-founder of PledgeCents, adds, “By working together we can streamline the process so music teachers can deliver incredible learning, discovery and creation tools through MusicFirst’s Online Classroom without touching the music budget.” PledgeCents has simplified the process of creating successful fundraising campaigns. Teachers simply sign up and select the MusicFirst software tools they need. PledgeCents then creates a personalized fundraising campaign page that is easily shareable with students’ parents, family, and community members. When the fundraising goal is met, a MusicFirst team member will deliver the school’s MusicFirst account to the teacher. Established in 2012, MusicFirst is the Digital Education Division of the Music Sales Corporation. The Music Sales Corporation was founded in 1935 by the Wise family, chiefly producing classical and tutorial material. Today the US company is a major copyright holder in both popular and classical music. Located in the heart of New York City, this ofﬁce houses a multi-faceted group of executive, administrative, editorial and production staff. The extensive copyright and licensing department manages the ever-growing Music Sales catalogue. Also based here are the promotion and publication departments of the vast G Schirmer/AMP music catalogue with its many eminent composers that include John Adams, Samuel Barber, Elliott Carter, John Corigliano, Tan Dun and Gian Carlo Menotti. To learn more about the Music Sales Group, click here. PledgeCents is the preferred fundraising platform for all PreK-12 needs. By allowing anyone to raise funds, PledgeCents aims to eliminate the $1.6 billion teachers annually spend out-of-pocket for basic classroom needs. Over 1,800 schools representing over 300 public school districts in 50 states work to raise funds through the PledgeCents platform. With the addition of the newly launched Preferred Partner Program, PledgeCents has partnered with over 55 leading education technology companies to help schools and teachers receive access to the tools they need but cannot afford. For more information please visit: www.pledgecents.com or email info@pledgecents.com with any questions.